Students perform a variety of science experiments with this magnet set. Get one for every workstation! 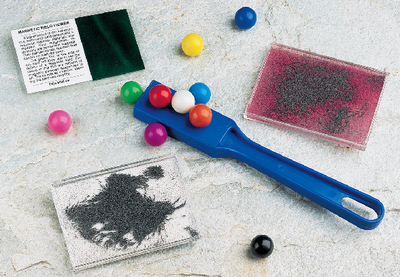 Contains an 8" magnetic wand, 10 colored magnetic marbles, magnetic iron filings in sealed case, nonmagnetic iron filings and sand in sealed case and a magnetic field viewer card. Caution: WARNING: KEEP AWAY FROM ALL CHILDREN! This product contains (a) small magnet(s). Swallowed magnets can stick together across intestines causing serious infection and death. Seek immediate medical attention if magnet(s) are swallowed or inhaled.